This video explains what this course is about. It talks about the concepts that will be taught and how they are organized into different units. Students will learn the definition of an exponent. 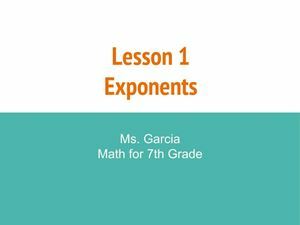 Students will write expressions using exponents and evaluate expressions with exponents in standard form. This is the explanation to the problems in the worksheet. Students will learn about squares, will identify perfect squares, and will find square roots of numbers. This lesson explains what factors are, the difference between prime and composite numbers, and how to find the greatest common factor between 2 or more numbers. This lesson explains what multiples are, how to find the multiples of a number, and how to find the least common multiple of 2 or more numbers. This video has the explanation to the worksheet for both factors and multiples. Students will learn what integers are, how to find the opposite of a number, and how to find the absolute value of a number. This is the video explanation to the problems in the worksheet. This video explains the rules and strategies for adding and subtracting integers. This is the video that explains the problems to the practice worksheet. This lesson explains the rules and strategies for multiplying and dividing integers. This is the video that explains the problems in the practice worksheet. In this lesson, students will get a basic overview of fractions. In this section, students will find equivalent fractions. In this lesson, students will learn how to simplify fractions. This lesson focuses on comparing fractions and finding the least common denominator between two fractions. This has the explanation to the practice worksheet. In this lesson, students will learn how to add and subtract fractions with common and uncommon denominators. This is the video explanation of the practice worksheet. In this lesson, students will learn how to multiply and divide fractions. This is the video explanation to the practice worksheet. In this lesson, students will learn how to convert improper fractions into mixed numbers and vice versa. Students will also learn to add, subtract, multiply, and divide mixed numbers. This section explains how to multiply and divide mixed numbers. This is the video explanation for the practice worksheet. In this lesson, students will compare decimals, round numbers, add, subtract, multiply and divide decimals. In this lesson, students will learn how to add, subtract, multiply, and divide decimals. This is the second video of two. In this lesson, students will learn how to convert from fractions to decimals and percents and vice versa. In this lesson, students will learn how to convert from percent to decimals and fractions. In this lesson, students will calculate percents and find the missing percents. This is the assessment for lessons 1 through 13 which covers basic number concepts such as exponents, squares, square roots, integers, fractions, decimals, and percents. In this lesson, students will learn how to evaluate algebraic expressions. This is the explanation to the practice worksheet. In this lesson, students will translate phrases into algebraic expressions and equations. In this lesson, students will solve simple one-step equations. In this lesson, students will learn how to solve two-step equations. In this lesson, students will learn about ratios and how to find unit rates. In this lesson, students will learn about proportions, how to solve them, and how to use them to solve real-world problems. This assessment covers concepts from lesson 14 on algebraic expressions to lesson 19 on proportions. In this lesson, students will learn about lines, line segments, rays, and angles. They will also learn about different types of angles and how to classify them according to their measurement. In this lesson, students will find the missing angles in triangles and polygons as well as classify triangles by their angles and sides. In this lesson, students will learn the difference between congruent and similar figures and then find the missing sides or angles of each kind of figure. In this lesson, students will learn how to calculate the area of different polygons such as rectangles, triangles, parallelograms, and trapezoids. In this lesson, students will learn about circles, how to find the circumference and how to find the area of a circle given the radius and/or the diameter. In this lesson, students will learn about different types of three-dimensional figures. In this lesson, students will find the surface area of different three-dimensional figures. In this lesson, students will find the volume for different three-dimensional figures. In this lesson, students will find the coordinates of points and plot points on a coordinate plane. In this lesson, students will learn about two types of transformations - translations and reflections. Students will find the translations and reflections of a figure. In this lesson, students will find the transformations for a figure. They will find the translations and reflections of a figure. This assessment covers concepts from lessons 20 through 29. The concepts include angles, lines, area, circles, surface area volume, coordinates, and transformations. In this lesson, students will learn about arithmetic and geometric sequences. In this lesson, students will learn about different ways of displaying data using frequency tables, line plots, stem and leaf plots, and scatter plots. In this lesson, students will learn about different ways of displaying data using graphs and charts such as bar graphs, histograms, circle graphs, and line graphs. In this lesson, students will find the mean, median, and mode for a set of data. In this lesson, students will find probabilities of simple events, draw tree diagrams, and use the Fundamental Counting Principle to find the total number of possible outcomes. In this lesson, students will use experimental probability to solve problems. In this lesson, students will use theoretical probability to solve problems. This unit assessment covers concepts from lessons 30 through 36. The concepts include patterning (arithmetic and geometric sequences), data management (ways of displaying and analyzing data), mean, median, mode, and probability. Grade 7 Math Course. This complete math course covers all of the major points taught across most schools in North America and prepares students for important topics which will be learned during Grade 8. The course consists of 42 content rich video-lessons, exercises, worksheets, practice review videos, unit assessments and resources which parents will have immediate access to upon purchasing this course. This course is unique among its counterparts because it is organized in a sequence that makes sense, it builds on the previous lesson, and provides plenty of examples to work from. Students taking this course will work with different abstract concepts including fractions, decimals, percents, algebraic expressions, geometry, and probability. However, there will be plenty of examples to work through, and they will be able to see the practical applications of each topic. The course is designed to provide real world connections to different topics although some lessons are made to build a skill before being able to apply to real-world applications. 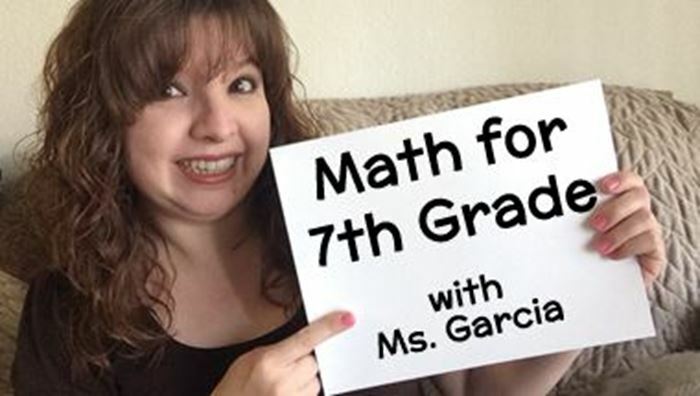 Upon course completion, students will be prepared to move on to increasingly challenging 8th and 9th grade math concepts, and to learn how to think critically, solve, analyze, and apply problem-resolution methods to different situations depending on the specific circumstances they come across. This video-course is primarily intended for Grade 7 students (typically ages 12+) and Grade 8 students who may need to review previously taught concepts. The difficultly level of this course is medium to medium-hard depending on the prior knowledge of each student. Over 20 hours of video-lessons! I am a former high school math teacher. I taught Algebra, Geometry, and Algebra II for nine years before I became an instructional technology specialist. Now I help teachers and students use technology in the classroom. However, my passion for math is always present. This has the answer key for Unit 1 Assessment. This has the answer key for Unit 2 Assessment. This has the answer key for Unit 3 Assessment. This has the answer key for Unit 4 Assessment.